India's first Mars orbiter mission takes off from the Satish Dhawan Space Centre at Sriharikota at 2.38pm. MOM started its MARS journey successfully launched at 2:38 pm on Tuesday, November 05, 2013 from Sriharikota spaceport. NASA will help ISRO with ground monitoring from three deep-space facilities after the launch. NASA will send its own probe, Maven, 13 days later. It will then begin a 9-month long journey towards the red planet and enter the Martian orbit in September 2014. Only 21 of the total of 51 missions sent to Mars by various countries have been successful. Mars Orbiter Mission is India's first interplanetary mission to planet Mars with an orbiter craft designed to orbit Mars in an elliptical orbit. The Mission is primarily technological mission considering the critical mission operations and stringent requirements on propulsion and other bus systems of spacecraft. emission in the Martian upper atmosphere (typically Exosphere and exobase). Measurement of D/H (Deuterium to Hydrogen abundance Ratio) allows us to understand especially the loss process of water from the planet. MSM is designed to measure Methane (CH4) in the Martian atmosphere with PPB accuracy and map its sources. This tri-color Mars Color camera gives images & information about the surface features and composi-tion of Martian surface. They are useful to monitor the dynamic events and weather of Mars. MCC will also be used for probing the two satellites of Mars -Phobos & Deiaos. It also provides the context infor-mation for other science payloads. MENCA is a quadruple mass spectrometer capable of analysing the neutral composition in the range of 1 to 300 amu with unit mass resolution. and emissivity are the two basic physical parame-ters estimated from thermal emission measure-ment. Many minerals and soil types have characteristic spectra in TIR region. TIS can map surface composition and mineralogy of Mars. Mangalyaan has a formidable itinerary: a 300-day, 780 million-kilometre (485 million-mile) journey to orbit Mars and survey its geology and atmosphere. perturbing force on the orbiter is due to the sun only. Orbit - to send a spacecraft from Earth to Mars with the least amount of fuel possible. tangentially to its orbit. The flight path is roughly one half of an ellipse around sun. intervals of about 780 days. Minimum energy opportunities for Earth-Mars occur in Novem-ber 2013, January 2016, May 2018 etc. Orbiter Satellite (1337 kg) into a 250 km x 23500 km elliptical orbit. The Satellite will be further navigated to a hyperbolic departure trajectory and thereafter it traverses an interplanetary cruise trajectory before reaching the intended orbit around the Mars. GTO) oF284 km X 21000 km. The vehicle has provision to launch multiple satellites. version which has already been used in Four earlier Missions. Second Stage (PS2) Propellant filling commenced. Mobile Service Tower (MST) withdrawal upto 50m is completed. Mandatory Checks and Preparations for Propellant filling operations of Second Stage (PS2) are in progress. Propellant filling of PS4 stage and RCT completed. Mixed Oxides of Nitrogen (MON) filling of PS4 completed at 17:00 hrs (IST). Mixed Oxides of Nitrogen (MON) filling of PS4 under progress. Mono Methyl Hydrazine (MMH) filling of Reaction Control Thrusters (RCT) completed. Mono Methyl Hydrazine (MMH) filling completed. Propellant filling operations of Fourth Stage (PS4) are in progress. The 56 hr 30 min countdown of Mission commenced at 06:08 hrs (IST). All the pre-countdown activities have been completed satisfactorily and the 56 and half hr countdown of Mission will commence tomorrow at 06:08 hrs (IST). Pre-count down activities of Mission commenced at 08:45 hrs. Launch Rehearsal of PSLV-C25/Mars Orbiter Mission has been completed successfully in the afternoon on Oct 31, 2013. 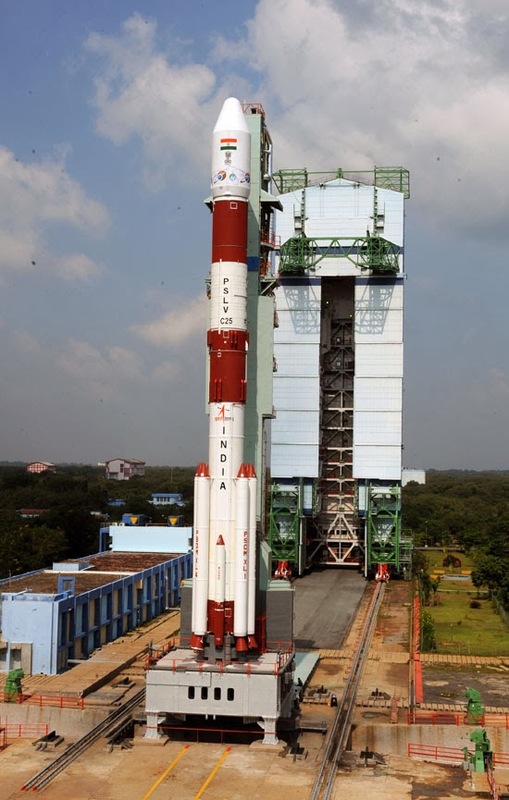 Launch Rehearsal of PSLV-C25/Mars Orbiter Mission commenced at 06:08 hrs (IST) on Oct 31, 2013 at First Launch Pad, SDSC SHAR. Vehicle systems powered and health is normal. Spacecraft & Launch Vehicle integrated level checks completed. Preparations for Launch Rehearsal are under progress. 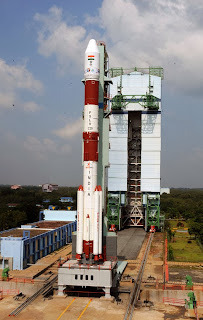 Spacecraft Integration with the Launcher PSLV-C25 Completed. Heat Shield Closure Activity is completed. Not to be pessimistic but I can't see this ending well. I don't know why, when every other country want to explore mars, we also want to do the same? Why can't we send a probe to venus or to a planet beyond mars? First of all, they should look at properly placing GSLV rockets on the orbit. This at least, will be useful. So Mom India also has intelligentsia among her offspring.May the mission be marvellous .Thanks for the detailed info.